2009-09-07. New. Ships with Tracking Number! INTERNATIONAL WORLDWIDE Shipping available. Buy with confidence, excellent customer service! 2008-01-01. Good. Ships with Tracking Number! INTERNATIONAL WORLDWIDE Shipping available. May not contain Access Codes or Supplements. May be ex-library. Shipping & Handling by region. Buy with confidence, excellent customer service! 2009-06-03. New. Ships with Tracking Number! INTERNATIONAL WORLDWIDE Shipping available. Buy with confidence, excellent customer service! 2009-01-08. New. Ships with Tracking Number! INTERNATIONAL WORLDWIDE Shipping available. Buy with confidence, excellent customer service! Harper Perennial. Used - Very Good. Very Good condition. 2009-09-07. Good. Ships with Tracking Number! INTERNATIONAL WORLDWIDE Shipping available. May not contain Access Codes or Supplements. May be ex-library. Shipping & Handling by region. Buy with confidence, excellent customer service! NY: Harper, 2008. First US edition, first prnt. Originally published by HarperCollins in the UK in the same year. One of an unspecified number of copies with the publisher's tipped-in page signed by Cornwell as issued. "Signed First Edition" sticker on front panel of dustjacket. Unread copy in Fine condition in a Fine dustjacket with an archival cover. Signed by Author. First Edition. Hardcovers. The images are of the book described and not stock photos. New York: Harper Collins USA, 2008. SIGNED by the AUTHOR on a special tipped in page. Signature only. A First edition, First printing. Book is in Fine condition. Boards are clean, not bumped. Fore edges are clean. Interior is clean and legible. Not remaindered. Dust Jacket is in Fine condition. Not chipped or crinkled. Not price clipped. Dust Jacket is covered by Mylar Brodart. All-Ways well boxed, All-Ways fast service. Thanks.. Signed by Author. First U.S. Edition. Hard Cover. Fine/Fine. Harper Perennial. PAPERBACK. 0061578908 New Condition. . New. First Edition. Hardcover. Fine/Near Fine. Signed! Hardcover first edition / first printing. Fine book in fine jacket, not price clipped, Signed on a custom designed bookplate and is author's signature only. Minimum scuffing and edge wear. No writing or marks Comes with Certificate of Authenticity for author's signature. Your books ship to you with protective mylar jacket, bubble wrapped in cardboard box. 2009-06-03. Good. Ships with Tracking Number! INTERNATIONAL WORLDWIDE Shipping available. May not contain Access Codes or Supplements. May be ex-library. Shipping & Handling by region. Buy with confidence, excellent customer service! HarperCollins, 2009-01-20. First edition, first printing. Hardcover. Fine/Fine. Signed by the author on a special limitation page. Octavo, 9 1/4" tall, 451 pages, black boards. A fine, clean, neat hard cover with little shelf wear, binding tight, paper cream white. In a fine, lightly worn dust jacket with the original price present. HarperCollins. Hardcover. 0061578916 First edition, First Printing. Signed by the author on the title page. Not inscribed, price clipped or otherwise marked. Securely wrapped, dust jacket in protective cover and shipped in a box. Full # line starting with a 1. . Fine. 2009. 1st Edition. HarperLuxe, 2009-02-03. Lrg. Paperback. Used:Good. HARPER. New. 8.02 x 5.4 cm. 2009-01-08. Good. Ships with Tracking Number! INTERNATIONAL WORLDWIDE Shipping available. May not contain Access Codes or Supplements. May be ex-library. Shipping & Handling by region. Buy with confidence, excellent customer service! Books on Tape, 2008. Audio Book. Good. Audio CD. 13 AUDIO CDs withdrawn from the library collection. Some library markings. We will polish the AUDIO CDs for your satisfaction. You will receive a good set. Enjoy this reliable AUDIO CD performance..
Harper Perennial. PAPERBACK. 0061578908 Like New Condition. . Fine. New York: Harper. Fine in Fine dust jacket. 2009. First US Edition; First Printing. Hardcover. 9780061578915 . International orders may require additional postage. ; Full number line. ; 1.65 x 9.13 x 6.61 Inches; 464 pages . Harper Perennial, 2009-12-29. Reprint. Paperback. Used:Good. New York: Harper Collins, 2008. A First edition, First printing. Book is in Near Fine condition. Boards are clean, not bumped. Fore edges have a tiny bit of shelf wear. Interior is clean and legible. Not remaindered. Dust Jacket is in Near Fine condition. Not chipped or crinkled. Not price clipped. Dustjacket is in Mylar Cover. All-ways well boxed, All-ways fast service. Thanks.. First Edition. Hard Cover. Near Fine/Near Fine. New York: HarperCollinsPublishers, 2008. First U.S. Edition. Cloth and boards. Fine/Fine. 8vo, black quarter cloth with gold lettering over black boards, frontispiece map of troop movements, Mylar-protected photographic dust jacket (unclipped) with images of knights, map endpapers of England and France: Agincourt, 451 pages. An epic adventure about England's great victory in 1415 by its "band of brothers" against powerful France. Bernard Cornwell is always on top of the latest archaeological and historical discoveries and weaves his historical fictions with a master's touch. EXCEPTIONAL CONDITION internally & externally! London, England: Harper Collins, 2008. very good hardcover, very good dust jacket.. Hard Cover. Very Good/Very Good. New York, New York, U.S.A.: Harpern Collins, 2009 Very good. Hard cover, very good dust jacket. Hard Cover. Very Good/Very Good. U.S.A.: HarperCollins, 2009. very good hardcover with dust jacket. some wear. Hardcover. Very Good/Very Good. Scranton, Pennsylvania, U.S.A.: Harpercollins, 2009. Book. Near Fine. Hardcover. 1st Edition. An Excellent Copy - A First Edition, First Printing, With The Corresponding Number Line. Book Is In Near Fine Condition. Boards Are Clean, Not Bumped. Fore Edges Have A Tiny Bit Of Shelf Wear. Interior Is Clean And Legible. Not Remaindered. Dust Jacket Is In Near Fine Condition. Not Chipped Or Crinkled. Not Price Clipped. Dust Jacket Is Covered By Mylar Brodart. Thanks And Enjoy..
New York: Harper. Fine in Fine dust jacket. 2009. Later Printing. Hardcover. 9780061578915 . International orders may require additional postage. ; 1.65 x 9.13 x 6.61 Inches; 464 pages . New York: Harper. Near Fine in Near Fine dust jacket. 2009. First American Edition; First Printing. Hardcover. 9780061578915 . Gently read copy. International orders may require additional postage. ; Full number line. ; 1.65 x 9.13 x 6.61 Inches; 464 pages . Harper, January 2009. Hardcover . 8.5 Bulk HB Premium. HarperCollins, 2009. Paperback. Good. Disclaimer:A copy that has been read, but remains in clean condition. All pages are intact, and the cover is intact. The spine may show signs of wear. Pages can include limited notes and highlighting, and the copy can include previous owner inscriptions. At ThriftBooks, our motto is: Read More, Spend Less.Dust jacket quality is not guaranteed. Harper Perennial. PAPERBACK. 0061578908 Special order direct from the distributor . New. New York: Harper, 2008. A First edition, First printing. Book is in Near Fine condition. Boards are clean, not bumped. Fore edges have a tiny bit of shelf wear. Interior is clean and legible. Not remaindered. Dust Jacket is in Near Fine condition. Not chipped or crinkled. Not price clipped. Dust Jacket is covered by Mylar Brodart. Thanks and Enjoy. All-Ways well boxed, All-Ways fast service. Thanks.. First Edition. Hard Cover. Near Fine/Near Fine. New York, N.Y.: HarperCollins, 2009. very good hardcover, very good dust jacket. Hard Cover. Very Good/Very Good. Harper Perennial. PAPERBACK. 0061578908 . New. Harper Perennial. PAPERBACK. 0061578908 Remainder mark . Fine. HarperCollins, 2009. First edition, first printing. Fine in fine dust jacket, in mylar cover. Condition: Fine in fine dust jacket, in mylar cover. Harper, 2009-01-01. Hardcover. Like New/Like New. Book has slight shelf wear from storage and use; otherwise the book is in very good condition. HarperCollins. Hardcover. 0061578916 First edition, First printing. Not price clipped. NOT REMAINDER marked. NOT ex library. Not Book Club. Dust jacket in protective cover. Shipped in a box. Number line starting with a (1). Fine/Fine . Fine. Scranton, Pennsylvania, U.S.A.: HarperCollins, 2008. 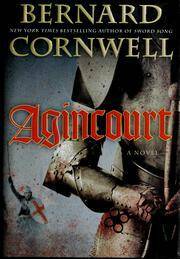 493pp Historical fiction about the battle of Agincourt Maps. Glossy Soft Cover. As New. NY: Harpercollins. Crisp, bright and tight. Very good to fine condition. Stain on top outer page edges. Stated First US Edition. first printing. The dust jacket is in excellent condition. "Young Nicholas Hook, a wanted man in England, is driven to fight as a mercenary archer in France, where he finds two things he can love: his instincts as a fighting man, and a girl in trouble." . Very Good. Hardcover. First American Edition. 1st Printing. 2009. Near Fine in Very Good+ dust jacket. Hardcover; First Impression. Hardcover. Spine end wear to Book & DJ, light scratches to DJ back. Overall, a clean and tight copy to read and enjoy. Harper, 2009. Near Fine Book in Very Good+ Dust Jacket. Price Intact. Dust Jacket protected with a new archival cover. Bubble wrapped and shipped promptly in a box. .
New York: Harper Collins, 2009. First U.S. Edition, First printing. Hard Cover. BOOKPLATE, OTHERWISE AS NEW IN DUST JACKET WITH ORIGINAL $27.99 PRICE. HarperCollins. Used - Very Good. Former Library book. Great condition for a used book! Minimal wear. New York: HarperCollins Publishers, Inc., 2009 Book. Fine. Hardcover. 8vo - over 7¾" - 9¾" tall. F/F, used, hc, map end papers, 451 pages. Interior clean and near bright, no marks, binding tight. Slightest of edge wear to dj, no chips or tears..
HarperCollins. Hardcover. 0061578916 First Edition. First printing. Signed on the title page. NOT INSCRIBED or marked in any way. Securely wrapped and shipped in a box. This is a ADVANCED READERS copy not a hard cover. . Very Good. New York, NY: Harpercollins Publishers. Good in Good dust jacket. 2008. Stated First Edition; 1st Printing. Hardcover. 0061578916 . Small 4to 9" - 11" tall; 451 pages; Mylar Cover on dustjacket, Dust Jacket lightly rubbed. Book Tight .